The name of the “Science of the eight limbs” refers to how the Muay Thai instructs the practitioners to use both legs and arms and also the elbows and knees to perform attacks. It is very good for health. Also to get a greater effect in Muay Thai is the “clinch”, where you control your opponent’s position or hit him while holding his body with your arms. Muay Thai is very effective in the standing fight and exercise. You can use several techniques in this sport until the fight ends in the ground. From powerful and devastating blows, to immobilizing kicks, Muay Thai can take your opponent to the ground. 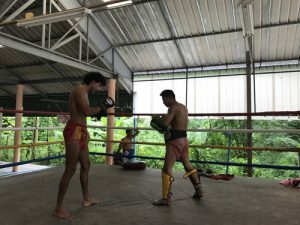 The Muay Thai camp is known for its simplicity and effectiveness, making it an ideal part of training for a Muay Thai fighter, especially because they have to play with various disciplines. We have mentioned that the best fighters in the world have Muay Thai as part of their background. Thanks to its versatility, it is part of the mixed martial arts training that any fighter should have.